Coxreels' dual hydraulic reels, designed for use with hydraulic tools and accessories, are offered in two configurations; the MPD and the TDMP series. As with most Coxreels spring rewind reels, the dual hydraulic reels feature single sided access for both the spring and the swivel. The supply and return lines come in the same side of the reel into an external fluid path via a removable, dual port hydraulic swivel. 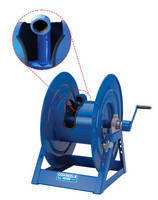 This same inlet and swivel side of the reel also houses an easy-to-service spring cartridge motor. 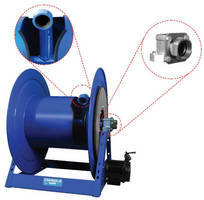 This design, unique to the industry, allows for service of the main components without removal of the reel when the reel is installed into truck body boxes, as is popular in the service truck industry. Because the reel can be installed with the back side of the drum right up against a wall without concern for incoming hose lines, space utilization is improved. For capacities up to 30 feet of dual hose, the MPD series features a dual axle support system with a solid steel 1 inch axle. 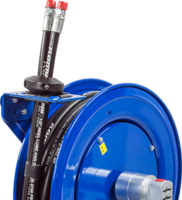 The TDMP is robustly built for capacities up to 50 feet with triple axel support, dual arm guides, and stainless steel hose guide rollers. 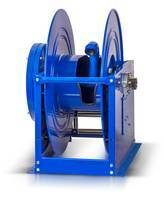 As with all Coxreels spring retractable reels, the dual hydraulic reels feature heavy gauge steel construction, durable polyester powder coat, rolled and ribbed discs, an industry leading 2-year warranty, and are manufactured in the USA. 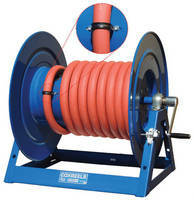 For further information on Coxreels' line of dual hydraulic reels, contact Customer Service at (800) 269-7335 or visit www.coxreels.com. 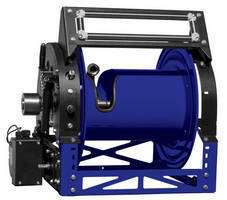 Hose Reels offer diverse configurations, features, and options.